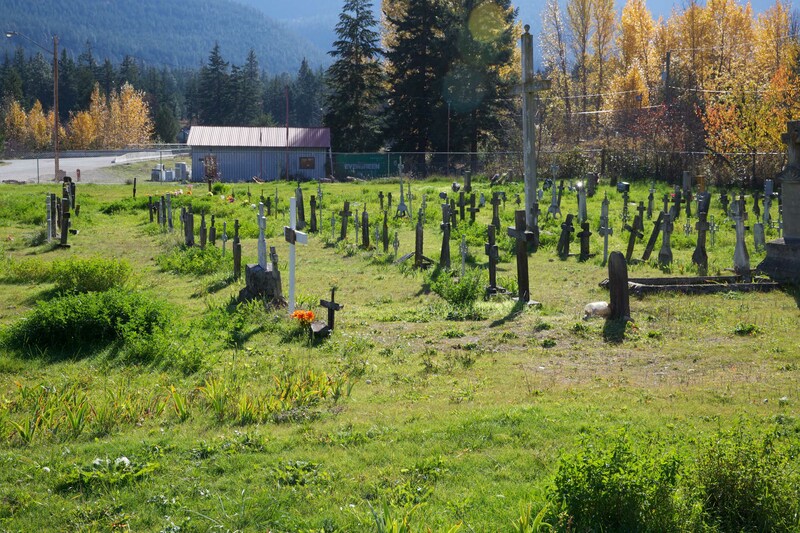 Forty-six kilometres from Pemberton, BC, in the cemetery of a town the English called Port Anderson, then D’Arcy, and the First Nations have always called N’Quatqua, rests a man named Joseph Joe. 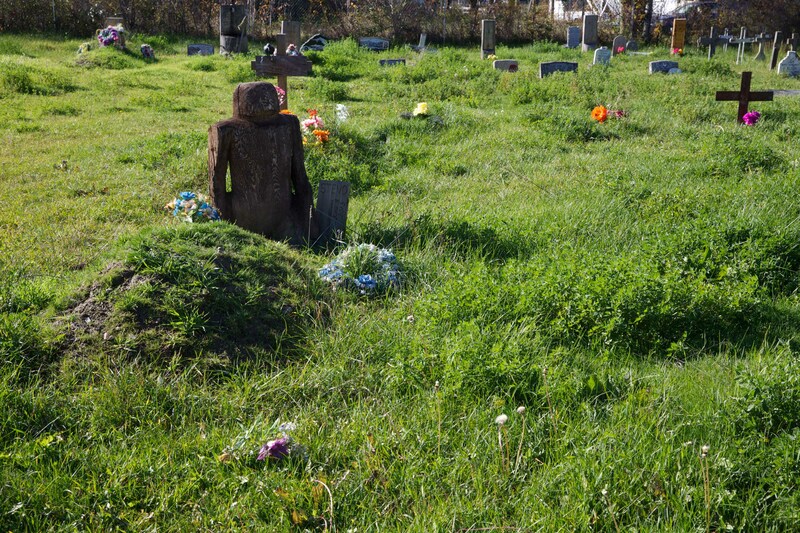 His headstone sits in the first row of the cemetery, with a good view of the wooden church across the road, which is kittycorner to the gas station and general store. Were he to rise from the dead, Joseph Joe could cross the street, pass the church, and immediately dip his toe into the surreally crystalline waters of Anderson Lake and admire the mountains that line its shores. Joseph Joe died, according to the inscription on the headstone, in 1955 at the remarkable age of 119. Which means that he would have been born in 1836. It’s not a ghost town, but there’s precious little in D’Arcy these days; natives were gathering mushrooms to sell to distributors the day we wandered by, and a few hunters were about, but there’s little trace of the excitement that Joseph Joe would have seen in his time, if indeed his long, long time was spent near the lake. 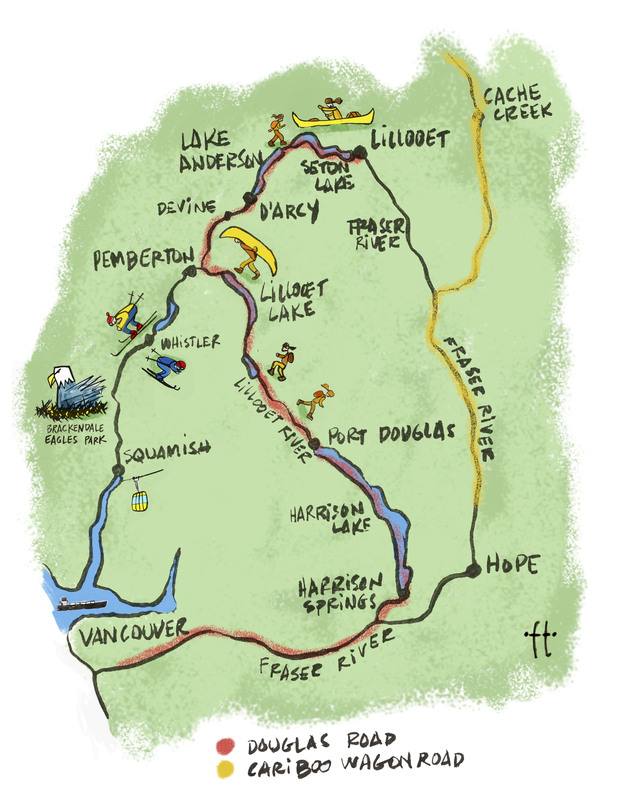 As a young man of 22, he would have witnessed the fevered, if brief, Fraser Canyon Gold Rush, during which the lake became part of a link to Lillooet and the rumor of riches beyond – and British Columbia essentially came to be. Some 30,000 miners, many from the U.S., streamed north for gold at a time when the population of Victoria was about 500. The influx led to conflicts on the way to Cayoosh Flats (Lillooet), including the Fraser Canyon War nobody told us about in school between miners and the Nlaka’pamux, the First Nations people of the Canyon. 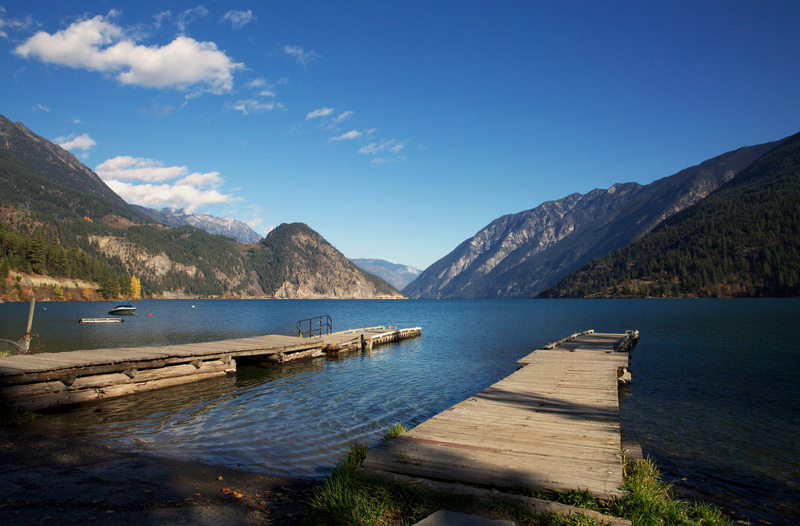 The perceived danger led miners to avoid this more-traveled route via Yale and head up through a new route via the lakes north of the Fraser Valley – Harrison Lake, Lillooet Lake, Joseph Joe’s Anderson Lake and then Seton Lake. The lakes are separated by portages of various lengths and arduousness that are unfathomable for those of us who outfit at MEC and follow our GPS. The ensemble of steamers on the Lake Route and the paths between them was dubbed the Douglas Road, after James Douglas, the newly-minted governor of the Colony of Vancouver Island. The road was, in fact, the first public works project in the new Colony of British Columbia, which had been declared in 1846. There would have been boatloads of hopefuls going up Anderson Lake. Maybe they stayed long enough to be part of the Cariboo Gold Rush further north, after the Fraser’s gold had been exhausted. Maybe, like many, they became British Columbians. When the gold rush ebbed, Port Anderson and Joe Joseph would have returned to their former rhythms until a new wave of whites arrived with the Pacific Great Eastern Railway, and the town was rebaptized D’Arcy, after D’Arcy Tate, VP of the railroad. Joseph Joe would already have been more than 70 years old then, in the early teens of the 20th century. Wonder what it would have been like to have the name of your home changed twice? 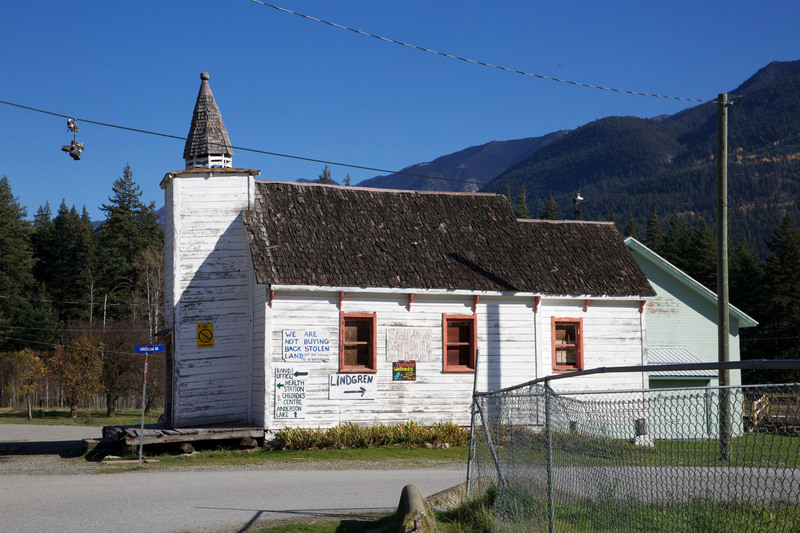 D’Arcy went quiet again until WWII, when a nearby area became home to a relocation centre for Japanese Canadians, who weren’t allowed to be within 100 miles of the coast. Because there still wasn’t a road to the coast from D’Arcy, rules were slacker than in other camps, and the Japanese men ended up working for one Frank Devine, who has a settlement named after him to this day. In 1939, when the war broke out, Joseph Joe would have been 103. The interweb entries runs dry after the war; D’Arcy was eventually joined by road to Pemberton. 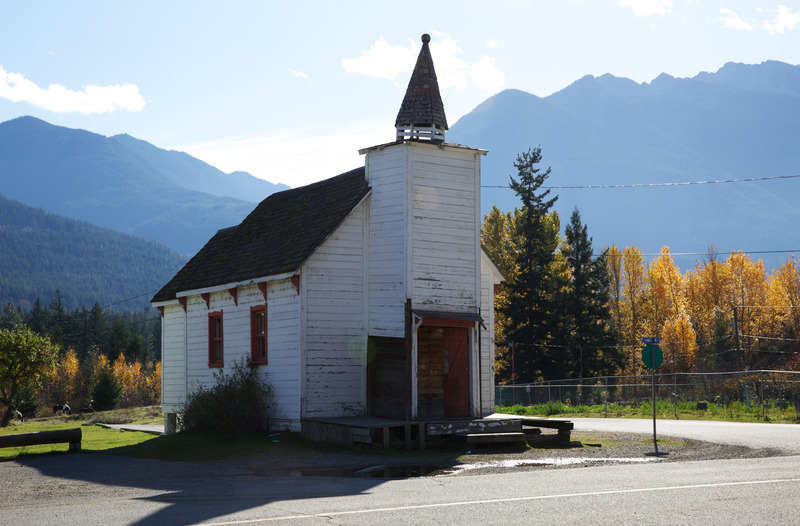 But the action now passes by Highway 99, which is a great summer road trip from Pemberton to Lillooet, and is now considered part of the Coast Mountain Circle Route and eventually part of a new Gold Rush Trail. Which means it’s going to be pretty quiet in D’Arcy for a good long while. Leaving Joseph Joe alone with the other souls to rest in peace at the head of a lake clear and beautiful as heaven itself. Posted in Voyages and tagged D'Arcy, Pemberton. Bookmark the permalink.